This vase is based on the Cochin China pottery style of three hundred years ago. 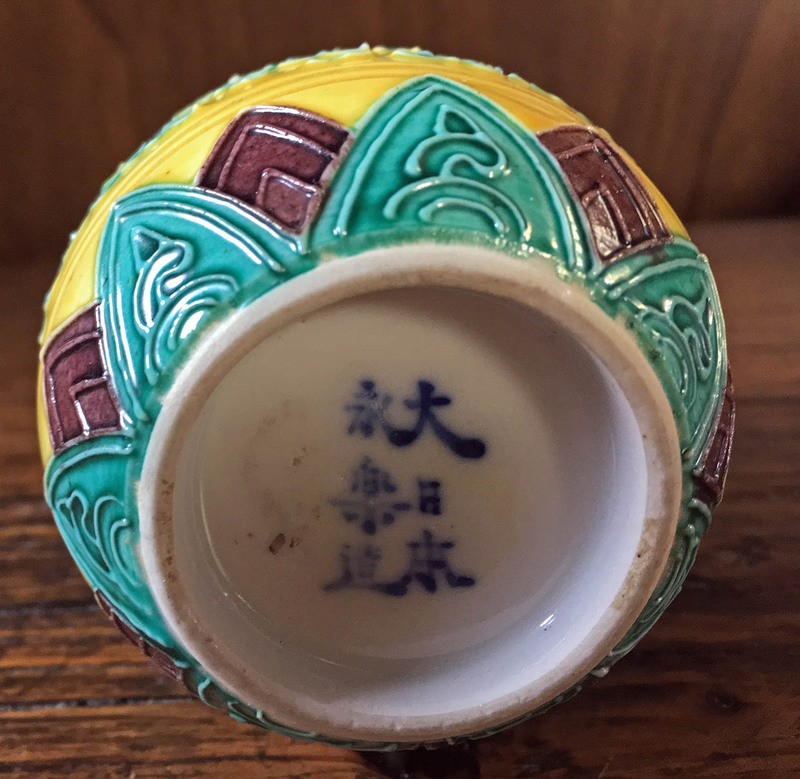 It has an impressed seal at the bottom of the vase reading “Great Japan Eiraku Made”. We attribute its age to the 15th generation of this famous line of potters, known as Shozen, who in 1929 took on the seal “Eiraku” used by Tokuzen, the 14th Eiraku potter. This vase has the well-known but seldom seen design of the “kara kusa” or Chinese grass design. On this vase, the main body has the colors of the ancient design in grass green and aubergine on a lemon-yellow ground. Like Cochin China pottery, these colors are kept separated from running into one another by raised outline of decorative designs. Scattered among the “grass” are stylized shape of birds in aubergine color. The base of the vase has a diaper of lance shape designs in same green and purplish colors projecting onto the yellow ground. At the top, a narrow frieze of the same purplish color meander vine design separates the yellow body from a black glazed shoulder and neck that end with a metal-silver glazed mouth. The contrast of an eye-catching yellow with a brilliant black glaze makes this small vase stand out. The glazes on this vase are soft looking enamel glazes. The raised designs on the surface of the ground resemble old Chinese cloisonné designs. Among Eiraku ware, this type is easily recognizable but rarely seen. Even though it is a Japanese ware based on ancient Chinese pottery model, it could be produced only in Japan as an Eoraku ware, truly in form, feeling , and style of decoration. 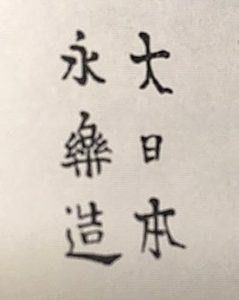 The seal “Great Japan Eiraku Made” is in the same character style writing as one shown in the publication “Japanese and Oriental Ceramics” by Hazel Gorham.